I swear everyone is an entrepreneur in Vietnam. There's a palpable sizzle of business-orientation in the air. 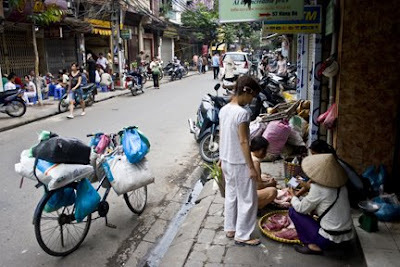 If you want to get a vibe of the Asian economy in real-time and see what the emerging markets buzz is all about, come spend some weeks in Vietnam! That said on the individuals level, overall Hanoi wasn't as interesting as I expected (granted, I was there for a workshop, and spent just a few days exploring the city). It's most definitely progressing at a rapid clip, but it remains unapologetically provincial. Old temples and historic sites seem either non-existent or not yet identified, restored and put on the map. It gave the impression of an architecturally simple, culturally uncomplicated and unpretentious city-- despite the high energy-- almost as if it's settling for claim as a Halong Bay stopover, totally disinterested in tourists. The North is completely different from the rest of the country, and is completely ok with that. Give the food trail a shot, it's worth the effort. We're big foodies, and we try as much local fare as is possible whenever we visit a new locale. 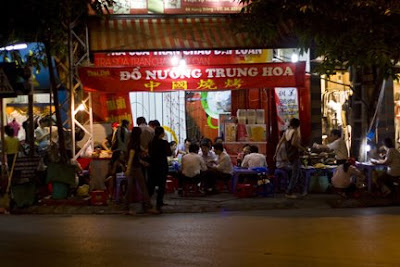 In Hanoi, the cuisine is more simple and isn't as spicy (chili hot or tasty good) as the royal cuisine of Central Vietnam or the fusion-ed fares of South Vietnam, but that doesn't mean it isn't good in its own right! 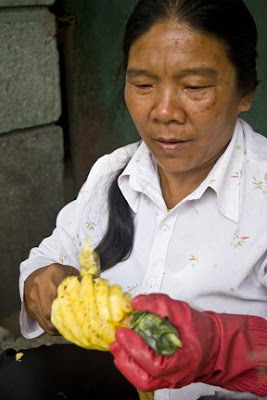 We found a huge variety of offerings, that we just couldn't fit enough meals in a day. Actually we had to settle for sampling numerous meals without finishing any one, both of us sharing just one dish! (thank goodness food was cheap!) In the evenings it was a feast: all sorts of food shops open in the tightest of quarters, squeezing as many customers into every crack of open space on the sidewalk. 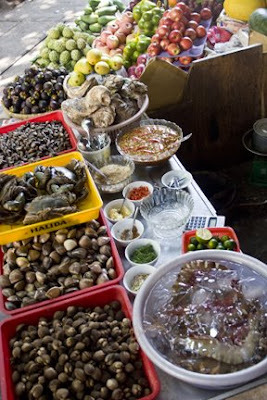 This is a very popular seafood grill corner. Stacked to the ceiling in one corner are many small plastic seats (like for children) and tables as is possibly needed. The a la carte dining choices are spread out over a large bed of ice. Customers point at the raw seafood preparations and they're brought to your small plastic table grilled. This is one of the seafood food shops in the Old Quarter. The food sits on beds of ice all day waiting for customers. 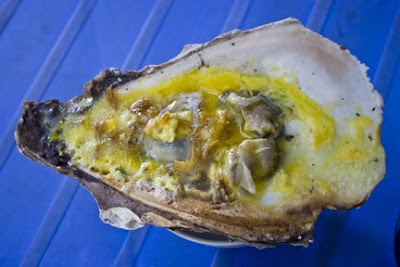 One particularly amazing preparation is the oyster. 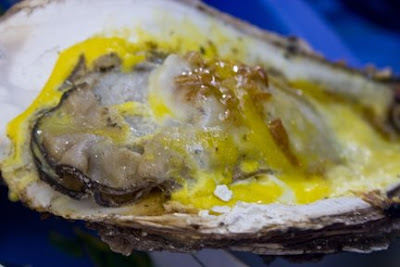 These oysters were at average 8inX6in HUGE. They're brushed with a special hot vinegar sauce, put on the grill, an egg broken over it, and served with hot sauce and dried garlic and onions. It's mouthwateringly, amazingly good. In May 2007 one of these was $1.50. We cleaned her out every time we walked by! 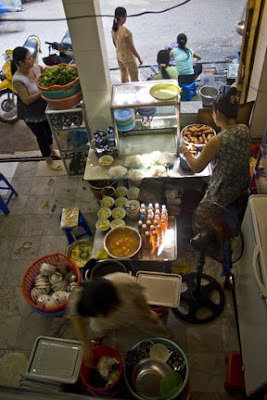 Bun-cha is a must-have for any visitor to Hanoi. This very large spread of a meal has such varied textures (soft noodles, crunchy fried spring rolls, tender meats, chopped vegetables..) and flavors (sweet, hot, herbal, vinegary, bitter) tossed together in a curious combination. One of the major bun-cha food shops is listed in the Lonely Plant. 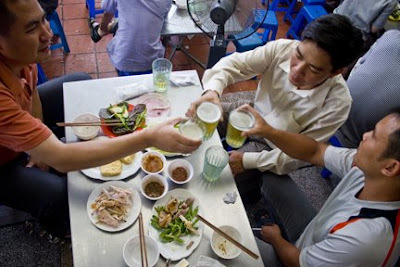 It is a Hanoi staple and only available at lunchtimes due to the labor-intensive preparations. 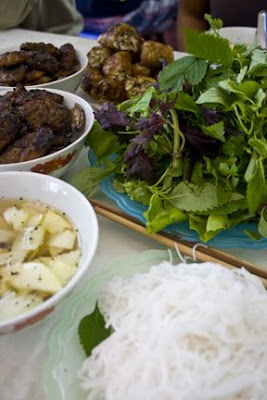 The Vietnamese like their meats-- anything that moves is game. Civets, field rats, snakes, bats, they all make it onto the famous grills. No one eats alone. If you're sitting by yourself, a group will invariably join you. These guys offered a taste of their meals to Keith, who looked on in curiosity as their orders were brought. They were happy to share, and by the time the various attempts at communications arrived at a semblance of understanding, he found out he'd just eaten dog meat. It is a healthy eating culture. Everyone eats a lot of raw foods-- fruits and vegetables. There are fresh vendors everywhere you turn. 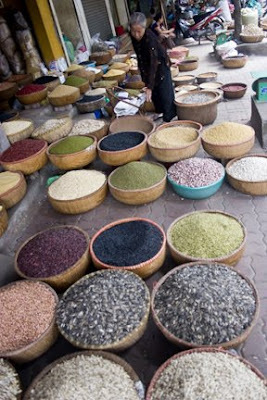 Sellers who rent a space at markets sell at a higher price than sellers who plant themselves on the sidewalk and spread out their items on the ground. 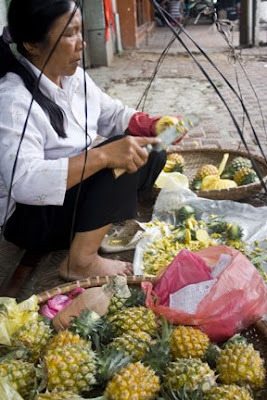 And sellers such as this one, who walk around with a pole and baskets of fruits hanging from each end, often sell for even less. Markets are one of the first places I love to check out when I'm new to an area. The environment and wares and goods are so telling of a people. 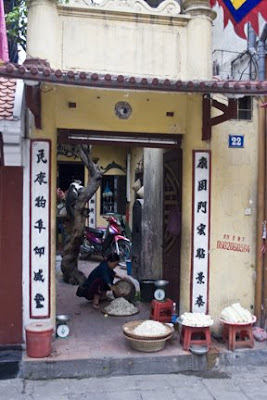 Here are some grains sold at the market near Old Quarter, and prepared foods just outside a pagoda near the hotel. See more photos at Keith Kelly's flickr page.